How did you come up with the idea for your holiday story? I knew I wanted to write a holiday story and I wanted to share my experiences of Hogmanay (new Year’s) in Edinburg with readers. All of Joanna’s reactions to the Hogmanay events (Torchlight Procession, Concert in the Garden of New Year’s Eve, Carnival with Ferris wheel) reflect my own. I love the decorations, the music and the chance to show the important people in my life how much I love them. I also love to see people being kinder to each other, and I love to see the look of surprise on people’s faces when they get something good they weren’t expecting. My mother and grandparents grew up in England. Each year, we always use Christmas crackers at either Christmas breakfast or Christmas dinner. And yes, we do wear the paper hats for the meal! What is your favorite Christmas memory as a child? Each year I spent time with my aunt and uncle, and later my cousin, to decorate their tree. I always looked forward to that overnight. We would pick out a tree, decorate it, watch holiday shows, and sometimes make decorations. When I bought my own house, I carried on the tradition with my youngest nephew and my niece. My favorite Christmas movie is Scrooge. I pretty much love all versions of A Christmas Carol, but the 1951 black and white version with Alastair Sim is my favorite. 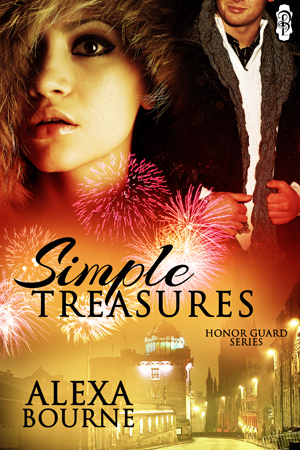 Giveaway: Alexa Bourne is giving away a free copy of my holiday ebook, Simple Treasures, and a holiday treat! Congrats on the release. Simple Treasures sounds fantastic. Can’t wait to read it. My favorite Christmas movie is another version of Scrooge; it’s Scrooged with Bill Murray. Funny! Congrats on your book. I have enjoyed Scrooge many times. One year I made Christmas crackers for my family. Each one was filled specifically filled for each person with small items they would enjoy. It really was a lot of fun! Pretty book cover. Happy holidays. Nice cover. Fun holiday traditions.